Boris Pasternak, although one of Russia’s greatest 20th century poets, is best known for his only novel, Doctor Zhivago, initially published in Italian in 1957. One year later, after becoming an international best seller which was banned in the Soviet Union, Doctor Zhivago was nominated for the Nobel Prize for literature. Under pressure from Soviet authorities, Pasternak renounced the prize, “triggering one of the great cultural storms of the Cold War” (p.13), Peter Finn and Petra Couvée write in The Zhivago Affair: The Kremlin, the CIA, and the Battle Over a Forbidden Book. Finn is national security editor for the Washington Post. Couvée is an affiliated researcher at Leiden University in the Netherlands who also teaches at Saint Petersburg University in Russia. In a work that reads at times like a novel itself, Finn and Couvée address the Cold War machinations surrounding the publication of Doctor Zhivago. The authors notably lay out for the first time the role which the CIA played in the novel’s publication. Rumors implicating the CIA existed almost from the time Doctor Zhivago first appeared, although many surmised that the agency had been only marginally involved. To the contrary, the authors demonstrate, the CIA was “in fact deeply involved” (p.17) in the publication of Pasternak’s novel. But its involvement is less central to the authors’ story than its prominent place in their sub-tittle indicates. Finn and Couvée create a vivid if bleak picture of the literary environment in post-World War II Soviet Union and they delve deeply into Pasternak, his enigmatic character and his tumultuous personal life. During the period in which he was writing Doctor Zhivago, Pasternak split his time between his wife Zinaida and his mistress Olga Ivinskya. Ivinskya became Pasternak’s literary alter ego and was imprisoned twice by Soviet authorities as a result of her association with Pasternak, the second time after Pasternak’s death in 1960. The other lead character in the drama is Italian publisher Giangiacomo Feltrinelli, an Italian Communist yet a man of means from a leading Milan industrial family. Feltrinelli arranged for the final manuscript of Pasternak’s novel to be smuggled out of the USSR in a suitcase in 1956 and published in Milan in 1957. Although Feltrinelli and Pasternak never met, they forged what the authors term “one of the greatest partnerships in the history of publishing.” Their secret correspondence, carried in and out of the Soviet Union by appointed messengers, serves today as a “manifesto on artistic freedom” (p.13). The authors describe Pasternak’s Dr. Zhivago as “[b]oth epic and autobiographical” (p.10), recounting the life, loves and losses of a fictional Russian physician Yuri Zhivago during the turmoil and chaos which the 1917 Russian Revolution wrought (“zhivago” means “the living” in Russian). Serving in a field hospital during World War I, the married Zhivago met and fell in love with nurse Lara Antipova. The two witnessed first hand the atrocities of the Russian Civil War that followed the revolution, committed both by the Bolsheviks and the anti-Bolshevik forces known as the White Russians. With the consolidation of Bolshevik power, Yuri and Lara parted, never to see one another again. When Zhivago returned to Moscow after the revolution, he found a city “wracked by chaos,” with his familiar world of art, leisure and intellectual contemplation “erased” (p.11). The power of Pasternak’s novel, the authors contend, lies in in its “individual spirit, Pasternak’s wish to find some communion with the earth, some truth in life, some love. Like Dostoevsky, he wanted to settle with the past and express this period of Russia’s history through ‘fidelity to poetic truth’” (p.16). Zhivago, they write, was like Pasternak himself, “from a lost past” of the Moscow intelligentsia, a “world to be disdained” (p.10) in the new Soviet order. Millions who never read the novel became familiar with the story from the 1965 David Lean film, in which Omar Sharif played Zhivago and Julie Christie was Lara. Pasternak disavowed any anti-Bolshevik agenda in his book but, with pages of disdain for the “deadening and merciless” Bolshevik ideology (p. 16), it is difficult to read Doctor Zhivago as anything but a harsh indictment of the revolutionary changes that the Bolsheviks sought to effectuate throughout Russian society. Doctor Zhivago appeared after Soviet leader Joseph Stalin died in 1953, a time when the Soviet Union sought to distance itself from the harshest manifestations of Stalinist rule and defuse tensions with the West, while staying loyal to core Bolshevik principles. Yet Stalin’s ghost most assuredly haunted Communist Party General Secretary Nikita Khrushchev and the Kremlin authorities under him as they tried to figure out how to handle the potentially subversive novel. Pasternak was born in 1895, and was thus 22 years old when the Russian Revolution broke out in 1917, 62 when Doctor Zhivago was first published in 1957. His father was a renowned artist and illustrator whose father, Pasternak’s grandfather, was a Jewish innkeeper in the Black Sea town of Odessa. Pasternak’s mother was an accomplished musician. The authors describe the Pasternaks at the time of the Revolution as a “prominent family within Moscow’s intelligentsia, who looked to the West, and were disposed to support the political reform of an autocratic, sclerotic system” (p.22). In the land of Dostoevsky, Turgenev and Tolstoy, writers in pre-revolutionary Russia enjoyed revered status. The post-World War II Soviet Union was still a society where novels, poems and plays were not only “hugely significant forms of communication and entertainment” but also the “subjects of fierce ideological disputes” (p.14). Because of his accomplishments as a poet, Pasternak was entitled to live in Peredelkino, an exclusive “writer’s colony” outside Moscow, with perks unimaginable for average Soviet citizens. Within the Soviet literary establishment, however, recognition of Pasternak’s talent was tempered by “doubts about his political commitment, and for long periods original work by the poet was not published” (p.5). In 1946, Pasternak was removed from the Board of Union of Soviet Writers, which considered Pasternak “lacking in ideology and remote from Soviet reality” (p.56). By 1949, when at work at Dr. Zhivago, Pasternak had been “banished to the edges of literary life in Moscow” (p.66). Throughout the post-war period, he earned a living as a translator of foreign literature, becoming one of the premier Russian interpreters of Shakespeare’s’ plays and Goethe’s Faust. Pasternak wrote Dr. Zhivago in fits and starts after the termination of World War II hostilities. As was customary in Russia, Pasternak shared early drafts of Dr. Zhivago with fellow writers. While working on these drafts, Pasternak met Olga Ivinskaya, 20 years his junior, twice married – her first husband committed suicide, her second died during the war — and an editor of the literary magazine Novy Mir, then the official organ of the powerful Union of Soviet Writers. “Pretty, voluptuous and sexually self-confident despite the prudish mores of Soviet society” (p.62), Ivinskya was commonly thought to be the model for Lara Antipova in Pasternak’s novel. Although Pasternak never left his wife Zinaida, his extramarital relationship with Ivinskaya lasted up to his death in 1960. Within the Russian literary world, Ivinskya’s affair with Pasternak set off “chattering about the deliciously scandalous liaison” (p.65). But the affair also attracted the attention of Soviet authorities who, on Stalin’s orders, had begun to crackdown on ideologically suspect writers. As a means of building a case against Pasternak, authorities interrogated Ivinskaya. Suspected of spying for Western powers and planning to escape the USSR, Ivinskaya was charged with having “close contact with persons suspected of espionage” (p.73) and, in July 1950, sentenced to five months imprisonment. She was released shortly after Stalin’s death in 1953. Although Pasternak had submitted his work to local publishers, he realized that Dr. Zhivago could not be published in the Soviet Union because it failed to conform to what he termed the Soviet Union’s “official cultural guidelines” (p.7). Pasternak knew also that he assumed a huge risk if he sought to have his novel published outside the Soviet Union. Hovering over all Soviet writers was the fate of Boris Polnyak, who was shot on Stalin’s orders in 1937 after being accused of seeking foreign publication for a novel. But Pasternak was willing to assume this risk. He was determined that his “final happiness and madness” (p.10), as he termed Dr. Zhivago, see the light of day. In 1956, Feltrinelli, the “unlikely Communist” (p.85), arranged through an emissary for the manuscript to be smuggled out of the Soviet Union. This was the period of Khrushchev’s not-so-secret February 1956 speech to the 20th Congress of the Soviet Union, in which he denounced Stalin’s crimes as a perversion of Bolshevik ideals. The thaw that followed the speech was “short lived; it would die with the Soviet invasion of Hungary” in October 1956 (p.89). But during this brief clearing when Feltrinelli received Doctor Zhivago, “[c]ooperation with Soviet writers and publishers seemed particularly opportune now that reform was gusting through the Kremlin” (p.89). Feltrenelli, who did not read Russian, sent the work to an Italian specialist in Russian literature. Having read the manuscript in Russian, the specialist concluded that failure to publish the novel would constitute a “crime against culture” (p.89). Ivinskaya, already imprisoned because of her association with Pasternak, feared for her own safety if Dr. Zhivago was published abroad. Pasternak’s wife also firmly opposed Pasternak’s foreign publication plans and numerous Western friends urged him not to have the novel published abroad. But Pasternak held firm, signing a secret contract with Feltrinelli’s firm, sent to him by courier. Despite desperate efforts by the Soviet Union to prevent publication, the first edition of Doctor Zhivago, translated into Italian, was printed in Milan on November 15, 1957. A second run of three thousand copies followed five days later. The book was an immediate international best seller, but was officially banned within the Soviet Union. The editorial board of the official Soviet literary magazine Novy Mir scolded Pasternak for his “non-acceptance of the socialist revolution. The general tenor of your novel is that the October Revolution, the Civil War and the social transformation involved did not give the people anything but suffering, and destroyed the Russian intelligentsia, either physically or morally” (p.99) — a conclusion which many historians today would characterize as accurate. But one of Pasternak’s biographers noted that the Novy Mir board missed the novel’s “most heretical insinuation: by artistically conflating the Stalinist period with early revolutionary history,” Pasternak implied that the “tyranny of the last twenty-five year was a direct outcome of Bolshevism” (p.100). For Pasternak, Stalinism and the purges were not, as Khrushchev was then contending, a terrible aberration but rather a “natural outgrowth of the system created by Lenin” (p.100). Frustrated by its inability to “roll back” communism in Eastern Europe and the Soviet Union, the CIA realized that Doctor Zhivago presented an opportunity to embarrass the Soviet government by placing the spotlight on Soviet suppression of a work of great literature in the tradition of Turgenev, Tolstoy and Dostoevsky. CIA involvement in the publication of Doctor Zhivago was one of the agency’s first efforts to leverage books as “instruments of political warfare” (p. 264), part of a broader agency effort to fund cultural activities and publications across Europe which would “manifest diversity and difference of view” between Soviet and American approaches (p.118), and thereby slowly undermine Soviet authority. President Eisenhower thus authorized a secret operation to publish Doctor Zhivago in Russian, with exclusive CIA control over the novel’s exploitation. Instead of having the State Department or the United States Information Agency trumpet the novel publicly, secrecy was employed, the agency contended, to prevent the “possibility of personal reprisal against Pasternak or his family” (p.116-117). The agency’s director, Allen Dulles, whose role in many far more nefarious plots is the subject of Stephen Kinzer’s book, The Brothers, reviewed here in October 2014, oversaw the operation. In some senses, the authors contend, the CIA was perfect for the Doctor Zhivago operation. Its budget was itself a secret and the agency “believed with genuine fervor that the Cold War was also cultural” (p.118). The 1958 Brussels World’s Fair, an event which a large number of Soviet citizens and Eastern European nationals were slated to attend, was the CIA’s target for distribution of the Russian version. The agency decided to use a New York publisher to prepare a Russian-language edition in the United States, but take the proofs to Europe for printing so no American paper stock would be used. If the Europeans printers obtained the copyrights from Feltrinelli “all the better.” If not the CIA decided, “we’ll do it black’’ (p.130). In the first week of September 1958, the Russian language edition of Doctor Zhivago rolled off the printing presses, bound in a blue-linen cover. The title page acknowledged the copyright of Feltrinelli, but botched the translation of his name in the Cyrillic alphabet. The copyright acknowledgment was a last minute addition “after a small number off early copies were printed without any acknowledgement of the Italian publisher” (p.138). The book was handed out to Soviet and Eastern European visitors to the Brussels World’s Fair at the Vatican Pavilion. The Soviet Union’s widely reported hostility to Doctor Zhivago “ensured that a novel that might otherwise have had a small elite readership became an international best seller” and made Pasternak an “almost inevitable choice” for the Swedish Academy’s 1958 Nobel Prize in Literature (p.13-14). Pasternak had previously been under consideration for a Nobel Prize and yearned for the recognition that such an honor would bring. In the aftermath of the decision to award Pasternak the Nobel prize, however, the Soviet Union “orchestrated a relentless internal campaign to vilify the writer as a traitor” (p.14). Pasternak was frequently described as a “Judas” who had betrayed his homeland for “thirty pieces of silver” (p.166). At Khrushchev’s urging, a speech to the Komosol, the youth wing of the Soviet Communist Party, referred to Pasternak as the “mangy sheep” of Soviet society who as a writer had “fouled the spot where he ate and cast filth on those by whose labor he lives and breathes” (p.180). Most ominously for Pasternak, Soviet authorities threatened him with expulsion from the Soviet Union. Ivinskya drafted a letter to Khrushchev, which Pasternak signed, pleading not to expel him from the Soviet Union. “I am tied to Russia by birth, by life and by work,” the letter read. “I cannot conceive of my destiny separate from Russia, or outside it” (p.182). In a telegram to Nobel authorities in Sweden, Pasternak renounced the prize, to the great disappointment of his fellow artists, both in the Soviet Union and worldwide, many of whom regarded his renunciation as an act of betrayal. A then- obscure schoolteacher named Aleksandr Solzhenitsyn “writhed with shame” that Pasternak would “demean himself by pleading with the government” (p.201). Editorialists around the world weighed in on the “startling virulence of the assault on a solitary writer” (p.186). A French newspaper described the Pasternak affair and its effect upon Soviet global standing as Khrushchev’s “intellectual Budapest” (p.186). 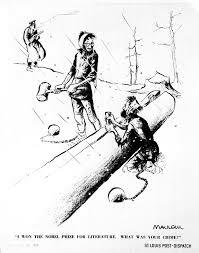 American political cartoonist Bill Maudlin won a 1958 Pulitzer prize for his depiction of a scruffy Pasternak in a Soviet prison camp wearing a ball and chain and chopping wood in the snow with a fellow prisoner. The caption read: “I won the Nobel Prize for Literature. What was your crime?” (p.186). 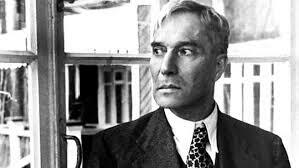 Amidst the worldwide controversy, the ever-enigmatic Pasternak died of lung cancer in May 1960. The Soviet Union did not report Pasternak’s death, although it was front-page news around the world. But the Pasternak controversy continued after his death, with Ivinskaya again paying a heavy price for her association with Pasternak. She was arrested for the second time, accused of being Pasternak’s link with Western publishers in dealing in hard currency for Doctor Zhivago. In the West, prosecution of Ivinskaya was seen as a “continuation of the Nobel campaign against Pasternak” (p.251). Ivinskaya was not released until 1964. Feltrinelli drifted out of publishing and into the Italian anarchist left of the late 1960s and early 1970s. He was killed in 1972, when a bomb he and co-conspirators planned to use to cut off electrical power in a Milan suburb went off prematurely. Khrushchev, for his part, was driven from office in 1964. In forced retirement, he had time, finally, to read Doctor Zhivago. The former Communist Party General Secretary concluded that he should not have banned the novel. “I should have read it myself. There’s nothing anti-Soviet in it” (p.256), he reportedly told his son. Khrushchev made the point explicitly in his own secret memoirs, dictated when he was a “virtual prisoner in his own home” (p.265). In an “irony that would surely have brought a small smile to Pasternak’s face,” Khrushchev allowed the tapes containing his memoirs to be “spirited out of the Soviet Union and published in the West’ (p.265). The idea that a novel could change people’s minds and make a difference in the Cold War confrontations between the Soviet Union and their Western adversaries seems today quixotic, “almost quaint” (p.263), as the authors put it. Yet that was the idea that motivated the CIA to put its resources, human and financial, behind its efforts to shine a spotlight on Doctor Zhivago. Uncovering the full extent of the agency’s disguised role in the dissemination of Pasternak’s novel constitutes a scoop for Finn and Couvée. But that role is a secondary theme in their book, overshadowed by the authors’ detailed and engrossing depictions of Pasternak himself and the post-Stalin 1950s Soviet literary world in which he operated, and by their always-timely account of the world-wide debate over intellectual and artistic freedom which the publication of Dr. Zhivago precipitated.